By the Beard of Zeus, I can’t believe my eyes! It took many hours of standing in an open field with a funny expression on my face but I can now set the record straight. Despite popular belief, if the wind changes, your face will NOT stay like that. Yes I’ve been at Tom Stacey’s notes again and I discovered that Tom has come across a number of myths whilst researching facial features. The other so-called myths are to do with the eyes. And I felt it was my duty to test out these myths to see if there is any truth in them. …By the Beard of Zeus, I can’t believe my eyes! This was easy enough to test out. I pulled a seat up to the television and watched five consecutive episodes of The Walking Dead. And yes, my eyes felt no different to when I watch telly from my normal position on the sofa. But I have to admit, I did feel a bit stupid resting the remote control on the side of the chair from such a short distance away. And for a time I couldn’t close my eyes without seeing rotting corpses. So I guess it isn’t harmful to the eyes but it may be harmful to the mind. That being so, it seems that people are no strangers to harmful pursuits when it comes to the eyes and I’m not even talking about Mascara wand injuries here (which funnily enough are the most common injury caused by cosmetics). No, I’m referring to a trend which started in the Netherlands in 2002 where tiny pieces of metallic jewellery are inserted under the cornea of the eye. They are known as extraocular implants and some of the current shapes available are the star, euro-sign, four-leaf clover and music note. I’m hanging on until they release a coloured heart with a script running across it that says ‘MUM’. What can I say, I’m a traditionalist at heart. But if you don’t fancy an eyeball decoration, how about some eye shaving. For seven years, Liu Deyan has run an eye cleaning stand in Chengdu, China. The process takes about five minutes and it involves pulling the eyelid back and then shaving and scraping the surface of the eye with a sharp knife. Apparently it used to be a common practice in China but was abandoned due to cross infection. I tested this myth out by wearing my father’s glasses for a couple of hours. True, I didn’t hurt my eyes but I did develop a cracking Michael Caine impression. Glasses are one way to improve eyesight but for some, surgery is the only solution. The earliest references to cataract surgery are found in Sanskrit manuscripts dating from the 5th century BC, which show that Susruta in India developed specialised instruments and performed the earliest eye surgery. In the Western world, bronze instruments that could have been used for cataract surgery, have been found in excavations in Babylonia, Greece and Egypt. There wasn’t really much testing here. I spend a ridiculous amount of time typing away in front of a computer screen. It doesn’t hurt the eyes but it can make them very tired. So, if you are really impressed by this blog piece it is okay to read it once a day but try not to read it too many times in a row. Taking care of your eyes is very important. But wouldn’t it be nice to learn about eye-care and be entertained at the same time. Well thanks to an ophthalmologist from Delaware it is now possible. 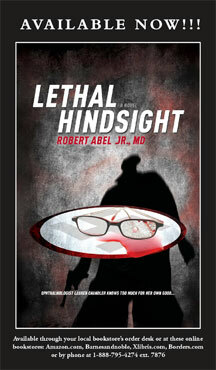 Dr. Robert Abel published a murder mystery novel and included some not-so-subtle clues to proper eye care. Dr Abel said he decided to use his passion for the written word to spread a message that should hit home with every physician, how to promote health to prevent maladies. “My main purpose for writing this book is not just to be seen on TV and become famous, but it is a great way to inform people about eyes,” Dr. Abel said. I’d like to add that like Dr. Abel, my main reason for writing ‘A Model Partner’ is not just to be seen on TV and become famous but it is also a great way to inform people about eccentric men who may have spent time in a horse-box and who may have followed women around with a camera and may have had some dealing with waxwork models of William Shatner. The world needs to know about these people…or this person…or emm…this fictional character. 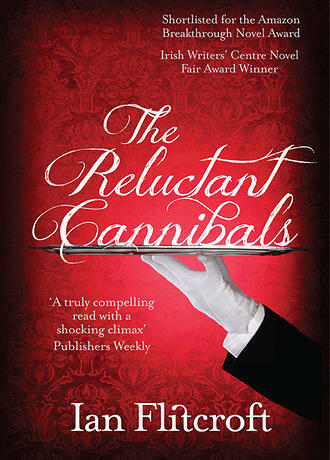 Of course, I couldn’t talk about eyes and literature without mentioning the book I’m reading and thoroughly enjoying at the moment called ‘The Reluctant Cannibals’ by Ian Flitcroft, an eye surgeon at Temple Street Children’s Hospital. It is about a dining society and a bizarre cannibalistic experiment. It is a quirky, funny and truly original read. And so far I haven’t found any messages about eye care hidden in the text! I decided to eat a bag of carrots to test this out and in the process I accidentally dispelled a different myth, the myth that if you continue to carry out the same task you will become better at said task. I say this because half way through the bag of carrots I somehow lost the ability to chew. For a time I cut the carrots up and tried to eat them with a bird-like throw-back of the head. But that didn’t work. Regardless, even after half a bag my eyesight didn’t improve. In saying that, I don’t think my results prove that eating carrots will have no effect on your eyesight. I think they just prove that I am not deficient in Vitamin A. Aside from carrots, people may look to another way to improve sight in the future. The novel Cyborg by Martin Caidin, the book from which The Six Million Dollar Man is based, is where the idea of a bionic eye-glasses originated. And now it appears that it may become a reality as the first bionic eye for US market awaits approval from the FDA. 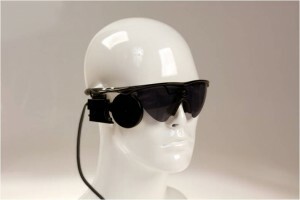 Second Sight’s Argus® II Retinal Prosthesis System or the bionic eye or more accurately, the artificial retina, will transform darkness into light using an electronic system in the eye and glasses which transmit a signal, helping the patient to see again. Over time the patient will learn to interpret electronic visual patterns thereby regaining some visual function. I’m not sure if a bionic eye would be much use to Tom Stacey in finding his ideal match.